Welcome to Aesthetica Sculptura...an art piece balanced between the creator and viewer. In the book, The Botany of Desire, the tulip uses humans’ desire for beauty to propagate and survive. This artwork mimics this evolutionary technique to not only survive, but to seek what it means to be beautiful in a world of different opinions. The sculpture uses the concept of “survival of the fittest” to morph into a sculpture that is more likely to succeed. A website was created to allow visitors to help define the physical parameters of this interactive sculpture. 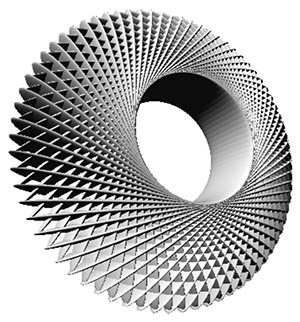 Unlike many crowd-sourced websites, this website is free to use and allows the user to modify some basic elements of the circular-like sculpture. As more users interacted with the website, the art became more sophisticated and “beautiful”. The final piece was displayed at the Cherry Creek Arts Festival. This website included a 3D interface that allowed visitors to play with many elements of the sculpture. As more people submitted their own creations, the website would calculate the "best" version among the submissions. As more users gravitated to more popular design structures, it became more difficult for other less popular structures to influence the final design. The artwork is an experimentation into crowdsourcing the concept of beauty. 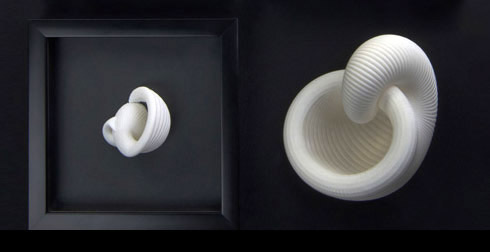 At the conclusion of the 21 day evolutionary timeline (May 6th - May 27th, 2016), the piece was 3D printed to replicate the exact state of the art. The sculptural piece along with phases from Day 0, Day 7 and Day 14 became part of the permanent collection of ARROW as part of their Five Years Out art series.